I've been sitting on this one for a little bit, but the solicitations just came out, so now I'm freed to post at will. Above is one of two covers for the final issue of the Boom! comic miniseries Hunter's Fortune. 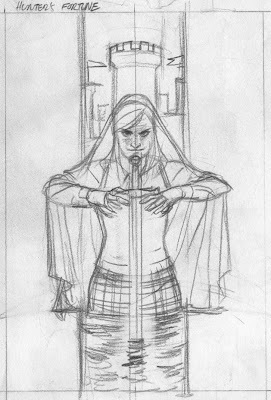 The second cover is by the ever talented, Phil Noto. Anywho, the series follows a young man (Hunter) who has inherited his recently deceased uncle's fortune. However his uncle has placed a stipulation on Hunter's inheritance, which is that in order to retain the many millions of dollars his uncle had, he must set out and uncover the mythic sword of Excalibur! Rough. 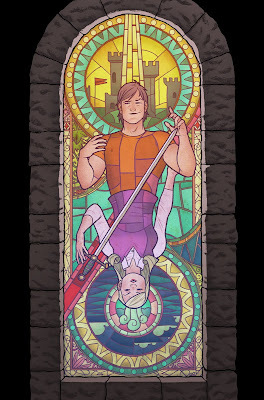 Because of the Excalibur theme, I decided to do a stained glass motif a la classic medieval architecture. It was not my first instinct. Here's alook at the sketches I did for the cover. This issue involved a character named Miranda who is also in search of the sword, and serves as a bit of a foil to our protagonist. There's also some reference to the 'Lady of the Lake', so I went slightly more conceptual showcasing Miranda AS the 'Lady.' This was my first sketch. This was my second sketch. 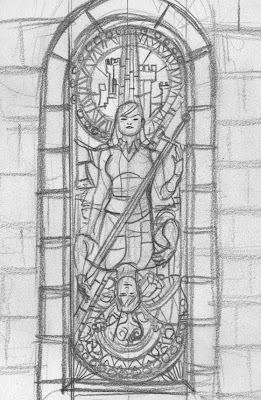 Pretty much the same as the final cover, though originally I had Miranda oriented at the top. Hunter being the main character, I was asked to flip the composition around. Even still, I tried to make each view of the illustration equally engaging. Hopefully that's true. HA! That's awesome Joe! Love it! 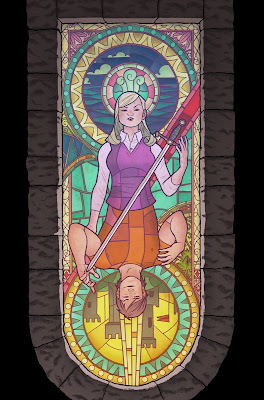 Does Maris know that you put her face on a dude in a stained glass window? Joe, GREAT COVER! (I'm the artist for Hunter's Fortune) Found your blog through Caleb Monroe (the writer). BTW, really love your work! You have a new fan! Thanks so much Matt! Likewise, great work on the issue! Really nice characterization.